EXCLUSIVE / Europe’s farming lobby has warned MEPs the industry will quit the European Union if they vote to cap agricultural gas emissions in a crunch vote this Wednesday (28 October) in the European Parliament in Strasbourg. MEPs will vote in plenary on the Environment Committee’s report on the revised National Emission Ceilings (NEC) Directive, which limits different types of air pollution in each EU nation. Agriculture, which has a notoriously powerful lobby, is responsible for 40% of methane emissions in the EU and 95% of ammonia pollution, according to the European Environmental Bureau (EEB). The EEB branded the mailshot a form of blackmail. When contacted by EURACTIV, Copa-Cogeca denied farmers would quit the EU. “We do not say we will quit the EU but we call for realistic targets otherwise production will be shifted to non EU countries where emissions are worse,” said a spokesperson. Methane is a more short-lived but much more powerful global-warming greenhouse gas than carbon dioxide. It also tranforms into ozone, an air pollutant. Ammonia causes soil nitrification and acidification. 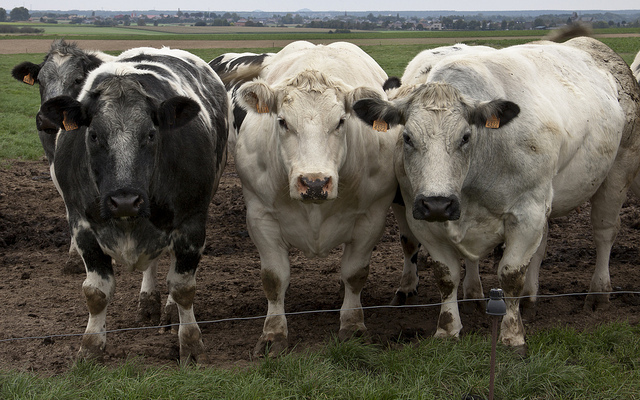 The revised NEC Directive is the first time the European Commission has tried to cap methane. The executive is pushing for a 30% methane reduction by 2030, backed by Environment Committee MEPs, and a 27% ammonia cut, which MEPs increased to 29%. Copa-Cogeca is a Brussels-based lobby association representing European farmers and agri-cooperatives. On Friday, the group’s secretary general Pekka Pesonen emailed MEPs a letter, which EURACTIV has seen. He said, “The targets […] are undoubtedly detrimental for the European farming community, the environment, the economy and the society as a whole becuase the only way to reach them is by reducing production in Europe and shift it to third countries. The European People’s Party, the largest group in the Parliament, has tabled amendments removing the methane and ammonia caps from the bill. Copa-Cogeca are thought to have targeted MEPs in the other groups in the legislature. Environmental campaigners poured scorn on what they described as a scandalous, empty threat to leave the bloc. They pointed out that agriculture sector was the only one pushing for preferential treatment. Unlike many other sectors, they said, its emissions reductions were slight, despite the availability of cost-effective technical solutions. A group of nine green NGOs, including the EEB, also wrote to MEPs last week. Over 400,000 people die each year because of air pollution, they said. Pesonen argued that the NEC Directive was not the right legislation to cap methane emissions. As it is a greenhouse gas, it should be handled by upcoming rules on the EU’s 2030 climate and energy targets, he said. In October last year, EU leaders agreed a target of at least a 40% reduction in greenhouse gases by 2030, compared to 1990 levels.The commitment is the cornerstone of the bloc’s negotiating position at the upcoming UN Climate Change Conference in Paris, which aims to limit global warming to two degrees above pre-industrial levels. In July, the Parliament’s Environment Committee backed stronger air pollution targets than the Commission’s original proposal. Before that, the Agriculture Committee had called for the methane and ammonia targets to be dropped from the legislation. The Environment Committee report on the NEC Directive was narrowly passed by the committee. 38 voted in favour, 28 against, and two abstained. National ceilings for six pollutants (sulphur dioxide, nitrogen oxides, ammonia, methane, particulate matter and volatile organic compounds) were set for countries to reach by 2030 by MEPs in the Environment Committee. They backed binding targets for 2025 for all the pollutants, except methane. Methane targets were delayed until 2030 to give the agriculture sector time to adapt. The Environment Committee report increases the ammonia reduction from 27% to 29% by 2030. Copa-Cogeca want the target brought back down to 27%. Wednesday’s plenary vote will seal the Parliament’s position ahead of negotiations with the Council of Ministers over the draft legislation. Both institutions must agree an identical text before it can become law. Environment ministers on 15 June demanded flexibility in meeting EU air quality targets, after dropping a cap on methane emissions from their version of the draft pollution rules. British Conservative MEP Julie Girling, the lead lawmaker on the bill, voted against her own report after a coalition of left and liberal MEPs pushed for the stronger targets. Girling argued that the stronger targets would derail negotiations with the Council of Ministers. The Council and Parliament were seen as so opposed over the bill that the NEC Directive narrowly missed being axed as part of the Commission’s drive for ‘better regulation’. In December, Commission First Vice-President Frans Timmermans said the rules would be changed during three-way talks between the institutions to make a deal more likely. My name is Pekka Pesonen and I am the Secretary General of the European Farmers and Agro-Cooperatives. I write to you concerning the upcoming vote on the revision of the National Emission Ceilings Directive during the Plenary on 28 October. As farmers we recognise the need to participate in the improvement of our air quality and to combating climate change, but I must admit that we are gravely concerned by the introduction of methane and ammonia targets that are unfeasible to implement. The targets that you are called to vote next Wednesday, 28 October are undoubtedly detrimental for the European farming community, the environment, the economy and the society as a whole because the only way to reach them is by reducing production in Europe and shift it to third countries. This huge structural change will impact the vast majority of European farms and to the way our agricultural model is organised. The Committee on Agriculture and Rural Development and the one on Industry, Research and Energy have already decided that methane should not be in the National Emissions Directive. Liaising with your colleagues I saw that there is a critical number of Members of the Socialists and Democrats who understand how important is to tackle methane in the right way and not within the National Emission Ceilings Directive. This is a genuine cross-partisan initiative with the support from Members of ALDE, ECR, EPP, and the Greens. Our plea to tackle methane emissions in the climate policy and not in the NECD, and for new feasible targets for ammonia is an undeniable proof that the European farming community is willing to do its part in combating climate change and improving the air quality we breath. Part of the package is the National Emissions Ceiling (NEC) Directive. It sets post-2020 national emissions ceilings (NEC) for six air pollutants, such as particulate matter (PM) and nitrogen oxide (NOx). Jean-Claude Juncker, the new President of the European Commission, pledged to refocus the EU executive on the bigger political issues of the day and cut regulations seen as unnecessary or hampering business activity. Commission First Vice-President Frans Timmermans was given a mandate to cut red tape and deliver “better regulation”. He has analysed pending legislation left over from the Barroso Commission and decided which should be dropped. The Commission's "better regulation" drive has caused unease with environmental organisations, trade unions and consumer groups, which have called on the Commission not to drop proposed gender and environmental laws.They called on the Commission to keep those laws on the Commission's 2015 work programme, presented in December. Responding to those calls, Timmermans announced that the Commission would ditch the Circular Economy package to replace it with “more ambitious” legislation in 2015, and change the NEC Directive, to ease its passing into EU law. “the industry will quit the European Union if they vote to cap agricultural gas emissions” …hmmm… let me guess – they will take their farms and go somewhere else? it will be interesting to see how that works. Empty threats from an industry that has thought of itself as an exception for far far too long. Dear Parr, the agriculture sector has not been off the hook. You are reffering to the automotive industry maybe. Please read the letter and the mail it was sent so that you can see that the production will be met by other third countries that have less stringent environmental regimes. This is not a threat by a fact since population is growing and so does demand. “Farm Lobby” to quite the EU?!? Only a Member State can quite the EU and even that has never been done. Or do they mean all European farms (houses, live-stock and soil) will quit and move to, say, Kazakhstan? Now that would be interesting to see. Or are they saying that the big agri-industry will quite operating on the European market and relocate to more welcoming countries such as North America and Australia? For many Europeans that would be a most welcome move and as case of game, set and match. Keep up the tough targets! Don’t take your eye off the ball. Stay strong EP. Give in to one groups demands and a domino affect could begin with no end in sight.